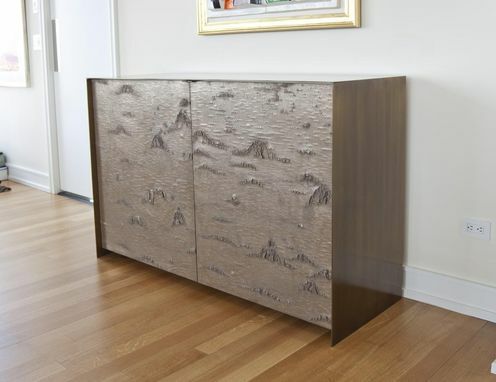 Antique Brass Credenza W/ Bronze Birch Bark Doors, Ultra Suede Drawers, Metallic Bronze Lacquer Interior. 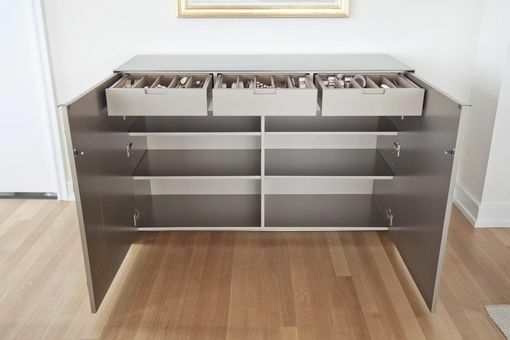 This was a one-off custom designed piece for a modern private residence in Upper East Side NYC requiring cabinet storage for china and silverware in the open plan dining room and gallery. The brass surround is back welded from sheet and angles and all the exposed surfaces sanded and hair lined to a satin polish and then antiqued patinaed. Within that is the metallic lacquered cabinet that is slid in and permanently installed. The doors are cast from large birch bark skins in bronze, the original patterns from which I got from a canoe maker in Washington State. 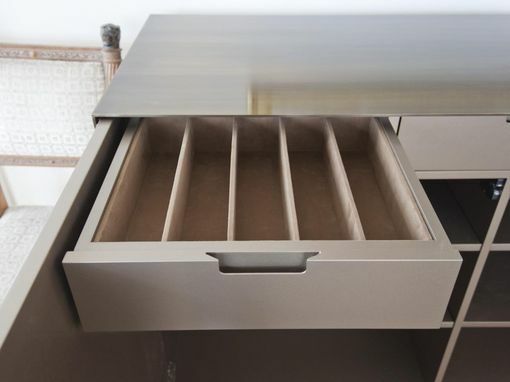 Ultra suede dividers were placed into the drawer boxes to protect the silverware and help prevent tarnishing. A hidden recessed steel chassis underneath the cabinet body provides a foundation for the weight of the piece to rest on. Floor levelers are mounted to the chassis so the end panels actually float 1/64 - 1/32" off the floor and don't scratch it, even though it appears to rest on these. Upward levelers prop the cabinet body tight against the steel top panel and prevent it from sagging. The lock was a requirement by the client. The remote controlled magnetic security locks are operated via a handheld numeric keypad. Contact me if you'd like something similar!